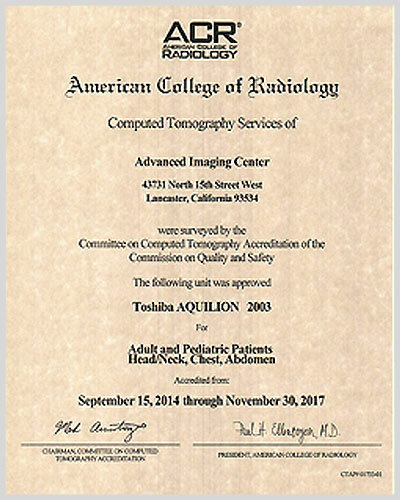 AIC is now the only MRI-Accredited Site in the Antelope Valley It is with great pleasure and excitement to announce that the MRI program at Advanced Imaging Center has been officially accredited by the American College of Radiology (ACR) as of June 14, 2000. It took several months of rigorous work to complete the stringent requirements, but AIC passed all the requirements first time around without any modifications needed. 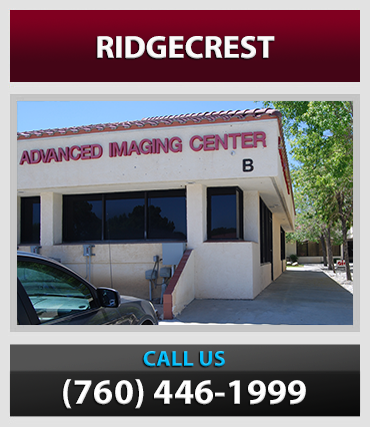 ACR is the only MRI-accrediting body in the United States. Both magnets at AIC including the OPEN MRI (Hitachi AIRIS, top left) and 1.5 Tesla high-field short-bore MRI (Siemens Symphony, top right) passed the test and are both accredited. 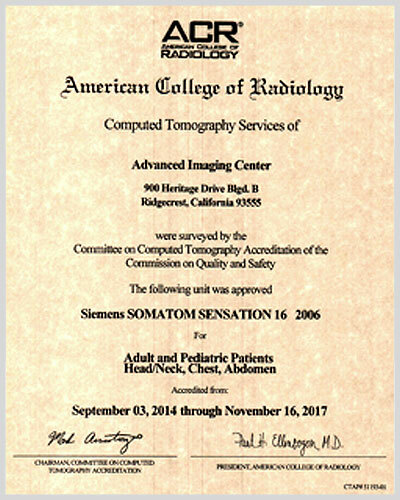 The radiologists and technologists also passed with flying colors. 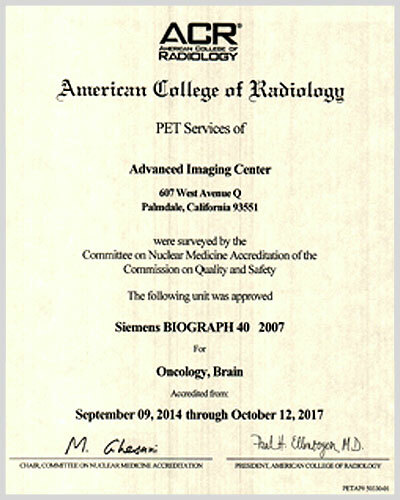 The ACR is a national organization servicing more than 30,000 radiologists, radiation oncologists, and medical physicists. 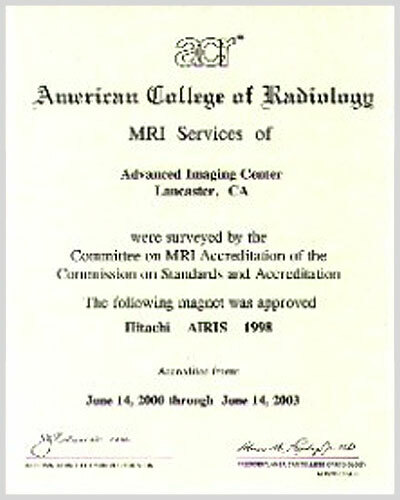 The ACR Committee on MRI Accreditation evaluates and accredits MRI practices in hospitals and in private offices across the United States. The ACR awards accreditation to an MRI practice for the achievement of high practice standards after an evaluation of its practice. 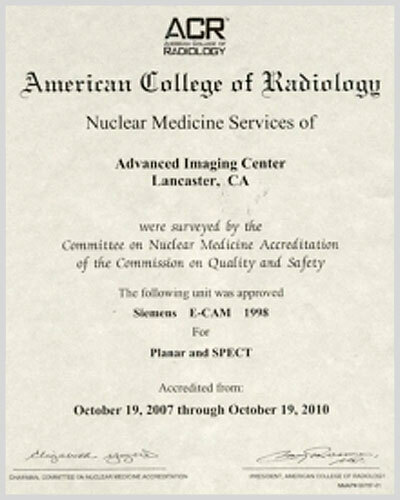 Evaluations are conducted by radiologists and physicists who are members of the ACR with special expertise in MRI. They assess the quality of the work being performed as well as the qualifications of the personnel involved. 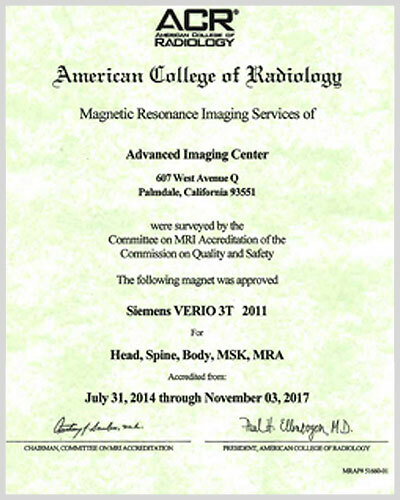 The reviewers report their findings to the ACR's MRI Accreditation Committee, which subsequently provides the practice with a comprehensive report. 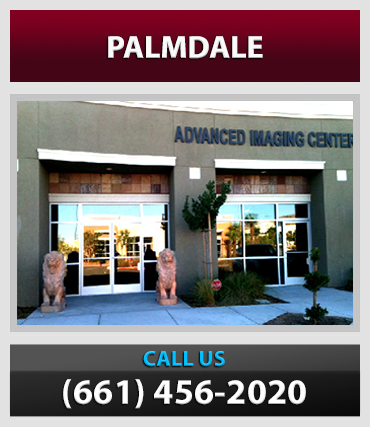 This makes Advanced Imaging Center the first and only MRI site in the Antelope Valley with MRI accreditation. 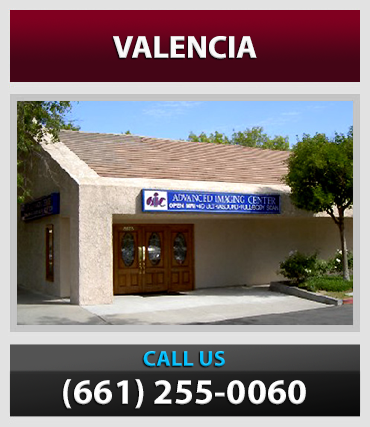 In fact, only a limited number of MRI sites in Southern California are accredited. 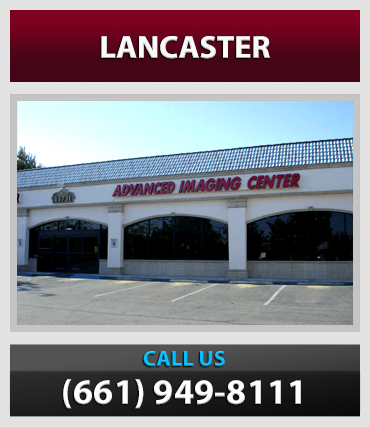 This is a testament to our dedication in providing the highest quality of MRI services for your patients at this facility. Congratulations to all the staff at AIC who helped reach this outstanding achievement. For more information, you may call me personally at (661) 949-8111 or call Michael Bernstein at ACR Public Relations Department at 800-227-5463.